The sneak peek photo I posted last month? Was for this! 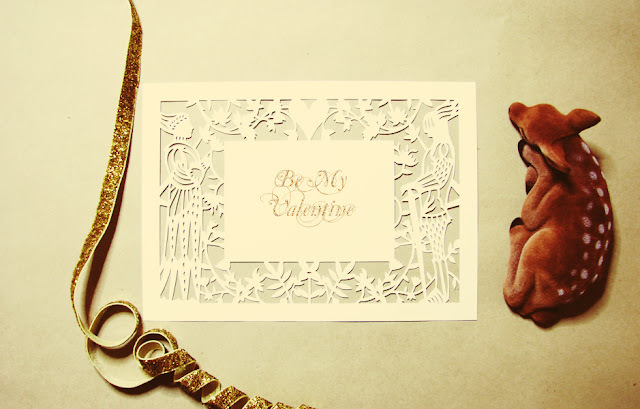 Just in time for valentine, an Etsy how to tutorial on papercutting a special valentine card / keepsake, template included. How-Tuesday: Keepsake Papercut. I love getting mail, but I love getting things I can put to use even more - so this card can also be a pretty great photo frame to pin on your notice board or fridge. The illustration itself might look like a lot of work, but it's pretty simple as far as my papercuts go. I happened to look at a lot of art nouveau book illustrations that week so I was in a romantic stage of knights and ladies. I hope you'll enjoy this tutorial and making a handmade card / present for your valentine, whatever awesome crafty idea you end up doing. Have a sweet valentine!